iOS 5 brought us some enhancements to the mail app but there is still no built in feature that will allow users to send emails with different color fonts or different font types and sizes. Luckily, there is a free app for the iPad that will allow users to send rich text emails with all of those different font options. 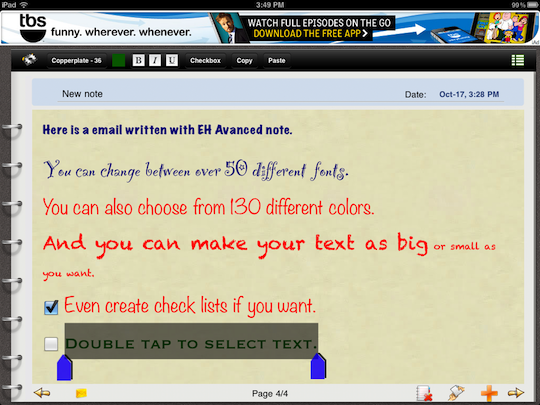 EH Advanced Note is a notes app that has 130 different colors, almost 60 different font types and the ability to change the font size to several different sizes. The app will let you add checkboxes for creating checklists. You can also use bold, italic and underline, which is also included in Apple�s mail app. 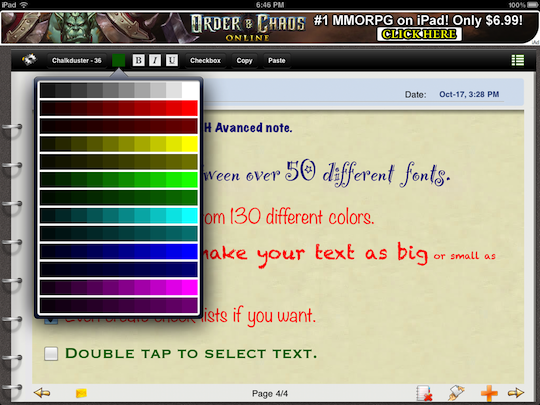 You can double tap text to highlight it, then select a different color, font type or size from the top toolbar. If you have an email that you created in the standard Mail app you can copy it, paste it in this notes app and send the email from the EH Advanced Note app after you edited the color and fonts. This free app is supported by an ad that is at the top of the screen. The ad is not intrusive and is a small price to pay for the features this app includes. The app includes way to share documents over bluetooth. Since there is no iPhone app available, I don�t know if many people will find file sharing over bluetooth all that useful. The developer promises to update the app regularly and encourages feedback, which can be sent via the app. 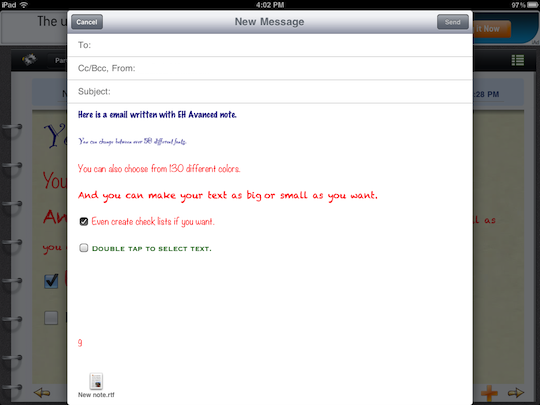 I can�t say it�s the best notes app I�ve ever used but I can say it�s best way I have found to send emails on the iPad with different fonts and colors. Get EH Advanced Note at the App Store for Free.